Scenic Salzburg – From Mozart to Maria – Why Waste Annual Leave? Just over a 2 hour train ride away from Vienna or Munich makes Salzburg a picturesque and easily accessible city to pair up with these destinations. Birthplace of the great Wolfgang Amadeus Mozart, the setting for the musical of all musicals, the iconic Sound of Music and the inspiration behind the song, ‘Silent Night’, we just had to squeeze time into our Christmas market break to see what is so special about this place. The first thing that hit me about Salzburg after coming from Vienna was just how cold it was. The city is high up in the mountains so you feel an instant chill when stepping off the train and even my tights-under-leggings-under-jeans display failed in sheltering me from the chill. The pace of life is slower here. If Vienna is a brisk walk, then Salzburg is most certainly an amble. The demographic seems to include a higher proportion of elderly people and it’s a really small city in comparison to the capital, making it quite easy to do all the touristy things on foot. Even if you’re not staying right in the heart of the old town, you’ll most probably only be a 10-15 minute walk away so consider this before paying premiums for more “central” hotels. The presence of Mozart and Maria are everywhere. There are countless companies advertising Mozart recitals and Sound of Music Tours, where you are taken to many of the locations shown in the film, given opportunities for singing and participating with costume-clad guides and the like. I’ve loved the Sound of Music ever since I was a child and my Mum first showed it to me so I’ll admit I was tempted. Pumpkin, however, is a dis-liker of musicals in any form (can’t sing, won’t sing?) so trying to persuade him to Edelweiss his way around the Salzburg hills would have been a near impossible task. So we compromised (you learn to pick your battles) and walked around the Mirabelle gardens ourselves but not without my rendition of ‘These are a few of my favourite things’ providing the soundtrack for the afternoon. If classical music is more your passion, then try and watch a concert in one of the grand music halls here in Salzburg. There is a venue at the top of the Festung fortress, which is a stunning location to see some live music. For either the Sound of Music Tours or the Mozart recitals, you’re looking at ticket prices of approximately 40-50 Euros per person. If you only have a day in Salzburg, don’t miss out on the Mirabelle Gardens and the funicular ride to the top of the Festung Fortress, where bizarrely, you get excellent free wi-fi if you want to sacrifice the tips of your digits to de-glove and get online. I speak from experience – mine went purple and I’m not sure it was worth it just to try and get in that real-time tweet. The ride itself takes just about 2 minutes and there are no seats but once you reach the top, you are afforded beautiful views of the Salzburg architecture. Try to go up about an hour or so before anticipated dusk to see the peachy sunset glazing the whitewash buildings.Ticket price includes an audio tour with individual audio guides in different languages. The tour takes about half an hour and provides a bitesize chunk of history to take home upon your descent. The funicular ride, if you are going at Christmas time, boards right by the site of the main Salzburg Christmas Market. 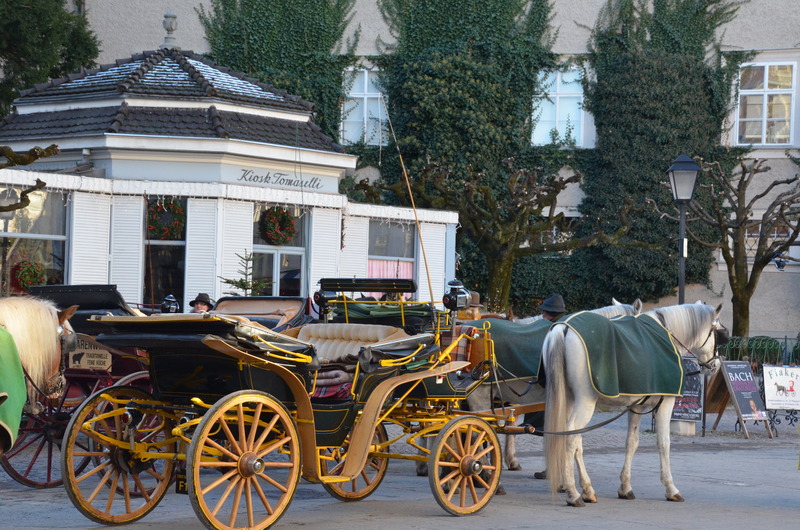 In the vicinity here, you will also find one of Salzburg’s most famous and frequented cafes, Cafe Tomaselli. We shied away from this after one glimpse at the crowds and instead headed across the bridge towards to see if Cafe Sacher or Cafe Bazaar were looking any roomier. With the buzz of the small Christmas market and the elegant horse-drawn carriages, you feel as if you have been transported back in time but for me, the most picturesque moment was not the panoramic viewpoint or the Sound of Music locations; it wasn’t even the view of the perfectly formed and seriously chocolatey Sachertorte. For me, the most beautiful moment in Salzburg was the view of the Marketstag lovelock bridge in Salzburg at sunset, with the mountains in the background, padlocks showering the Danube with ripples of emotion and the night lights casting their colours onto the water. If you are pushed for time, you could get away with just spending a day or two in Salzburg to see its main attractions but it has a quiet charm that you may find difficult to resist. Glad it took you down memory lane 🙂 I like that it’s small and cosy enough to be able to see the key sights in a day if that’s all you have – it’s such a pretty city! Thanks so much for commenting! My sister, mom and I did the Sound of Music tour and it was amazing!! We sang do re mi at the top of our lungs, and the scenery was gorgeous. 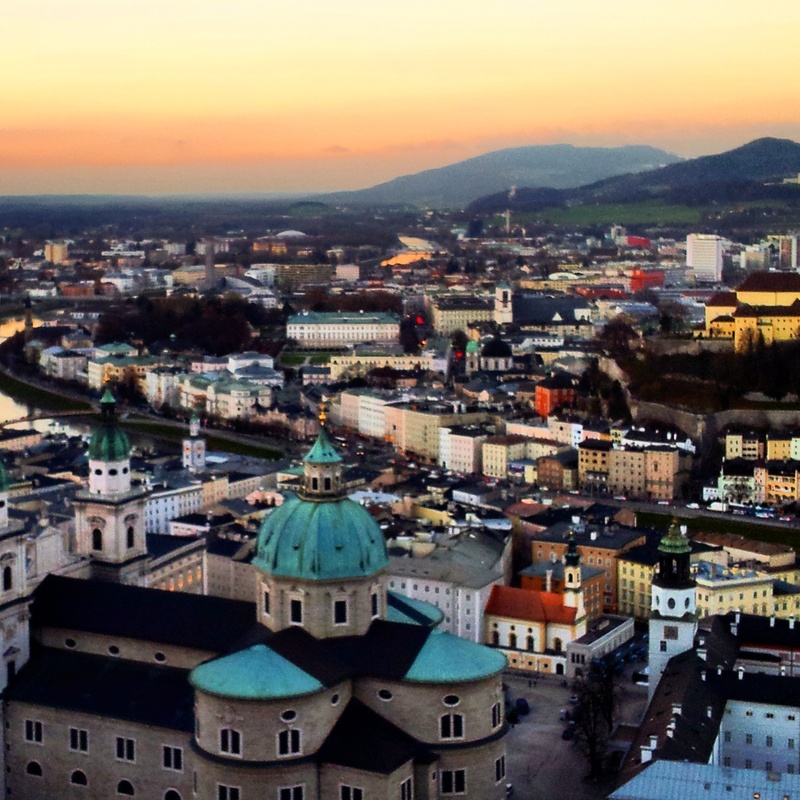 Shikha, I agree that Salzburg is a gorgeous city. The fortress, the main square, the cathedral, the restaurants, and I love walking down the street where Mozart’s house it. It’s so pretty. Christmastime is a great time to visit! It’s a beautiful city with some lovely hidden spots. I love that picture of the river at night. Stunning! I thought about visiting Salzburg (because I grew up on Sound of Music too!) when I was in Vienna, but I was just too tired to make another daytrip. I only had energy to do 1 daytrip and I did Bratislava. But Salzburg looks so pretty that maybe I should have gone there! ha! I would have loved to do the tour and sang all the songs. 😀 But D hates musicals too, heh. I don’t know why I haven’t done this yet! I love the sound of music, and mozart. Vienna is high on my list so I think I’ll try to do them together now. I didn’t know Salzburg was so easy to explore on foot. I though it was a massive city which you can’t really experience without using metro or trams. I’m looking forward to the winter now, thank you! 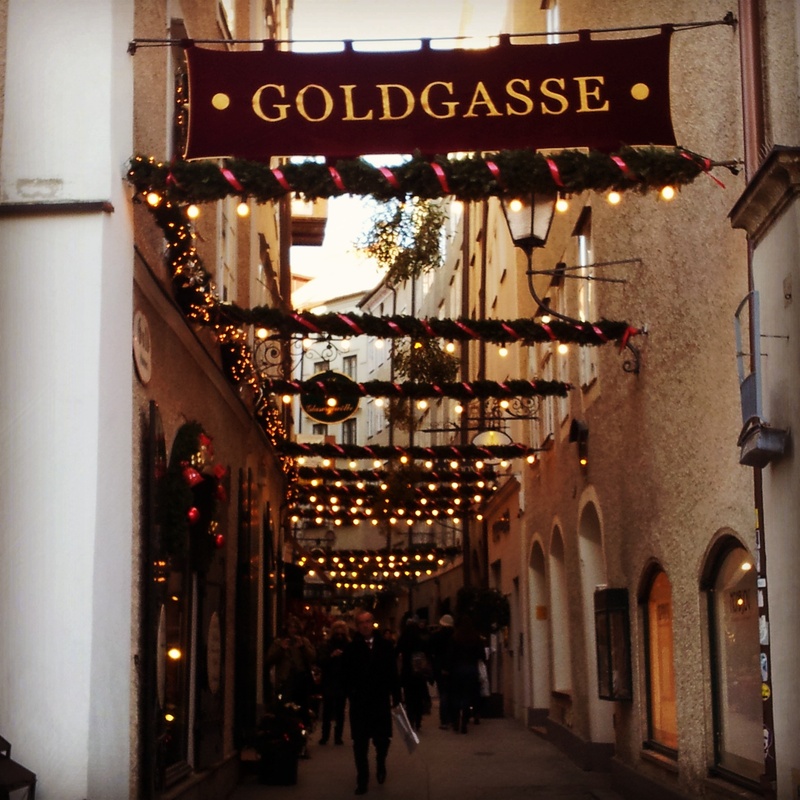 Love this post Shikha 🙂 I visited Salzburg earlier this year around Easter and absolutely adored it! This brought back so many beautiful memories. But I visited as a day trip from Vienna and didn’t have the pleasure of seeing the city after sunset. 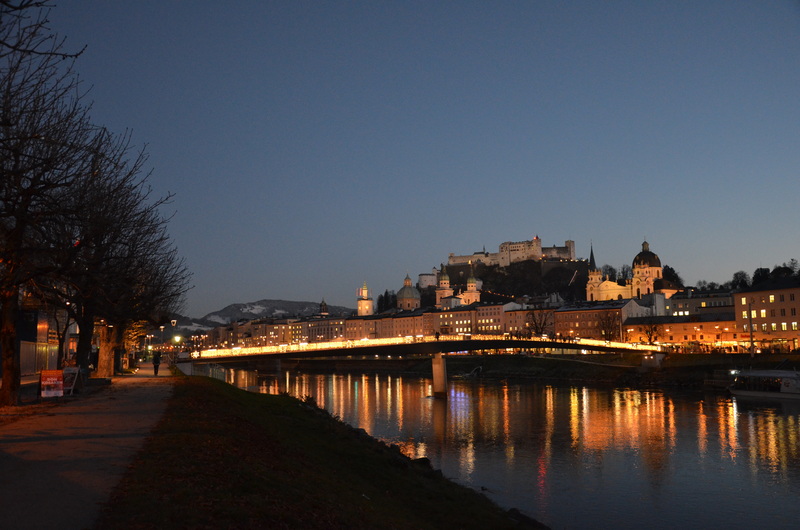 That last picture of Salzburg all lit up at night, oh my! How lovely! Such a beautiful city, Austria is so underrated! I whizzed through Salzburg on the train this summer and really want to go back and see it – I love the Sound of Music so the tour is a must! We went from Munich to Salzburg and I loved it! It is such a beautiful city. Now I regret that we weren’t able to make to Salzburg when I was in Austria, just a reason for another visit! Christmas (outside of the cold) sounds amazing there! I’ve always heard great things about the markets in Europe. I think Austria is an underrated country in general – it was one of my favorites in Europe, and also one of the least expensive! Austria has never really been high on my list of places to visit, but it actually looks lovely – pretty towns, mountain scenery, Christmas markets. 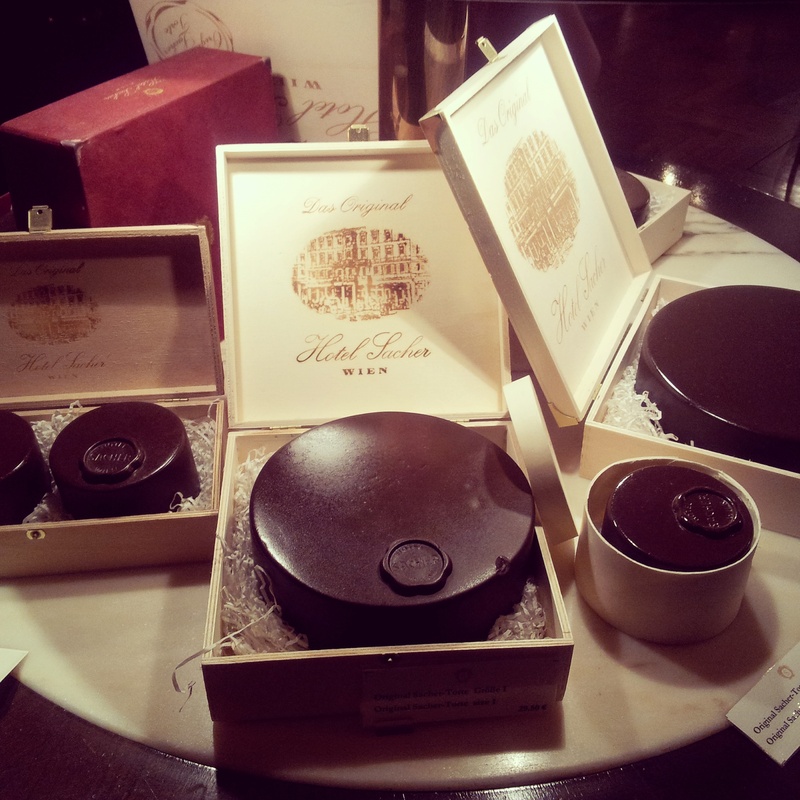 And, of course, sachertorte…! Hehe, that’s great! You shouldn’t be ashamed – who doesn’t love the sound of music and the tour sounds like such fun! Now the question is, would your lady be more agreeable than my man was?! Pingback: Festive Fun at Bruges’ Christmas Markets, Belgium | Why Waste Annual Leave?